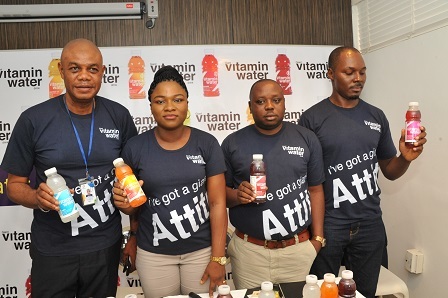 Giant Beverages Limited, makers of Valmont Premium bottled water has unveiled Giant Vitamin Water to the Nigerian market. The brand which is a breakthrough product with a range of unique variants was introduced at a media briefing, which took place on Wednesday at La Maison Fahrenheit in Lagos. According to the company, the product is made from demineralized water infused with natural fruit extracts, vitamin and minerals unlike carbonated drinks made from chemical compounds and sugar. The drink does not contain artificial flavours, colours and preservatives. The Marketing Manager of Giant Beverages, Mrs. Bose Ogunyemi, said that Giant Vitamin Water comes in one bottle size of 500ml but six delightful variants – Blackcurrant-Acai, Lingonberry-Boysenberry, Pineapple-Passion, Orange-lime, Lemon-Balm and Prickly Pear-Kiwi. Each variant, according to Ogunyemi, has a blend of vitamins and fruit extracts to deliver refreshing and naturally tasting hydration. 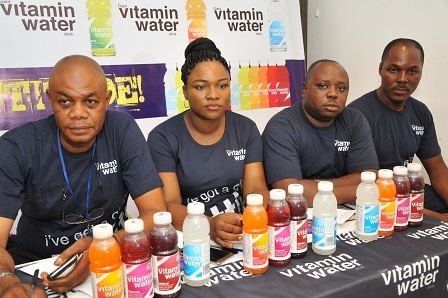 Also speaking at the event, Mr. Emmanuel Akpah, Regional Sales Manager, Lagos and South West revealed that Giant Vitamin water is now available in all parts of Nigeria. You will find it at shopping malls, markets, night clubs, quick service restaurants, supermarkets, universities, airports, beaches, etc. The introduction of the product, according to analysts have the potential of reshaping the non-alcoholic beverage market in the country as it will satisfy lifestyle conscious consumers, who are looking for alternatives from high sugar beverages. Giant Vitamin Water is a low calorie drink that actually satisfies thirst, unlike other carbonated drinks. There is no limit to the number of bottles that can be consumed by an individual. It contains vitamins and minerals that are beneficial to health,” Ogunyemi noted. Giant Beverages Limited is a new manufacturing company engaged in the production of natural and healthy non-alcoholic beverages. The company produces products of the highest quality and is committed to delivering quality service to its customers. Giant Beverages drinks are produced with the finest natural ingredients to meet high quality standards. The company’s brands include Valmont ultra-filtered premium water, Sojuice, a family juice brand and Giant Vitamin Water drink. I will be glad to be one of ur distributors in ibadan. Please can i get giant company direct contact is important. I need your contact want to be distributor. Am Mary ajoke adeaga,Diamond Cutie Company Name,No 6 Alli Street,Mokola Ibadan,Oyo State Nigeria.post Code 200202. Looking forward to hear from U Sir. I will be glad to be one of ur distributors in Calabar.